What's the most dominant half of football Ohio State has ever played? This exercise cannot be a question of points and statistics alone, otherwise we're mining cubic zirconias from first halves of peaceful paycheck games like Florida A&M in 2013 (eight touchdowns before halftime!) or the 66-0 romp against Kent State in September. The opponent and circumstances must determine eligibility here. Era is also important, since the Big Ten is already equipped with one school fortifying its legacy with greatness achieved before anyone's grandparents or over 80% of current football programs were born. We'll start with facemasks and color photography. 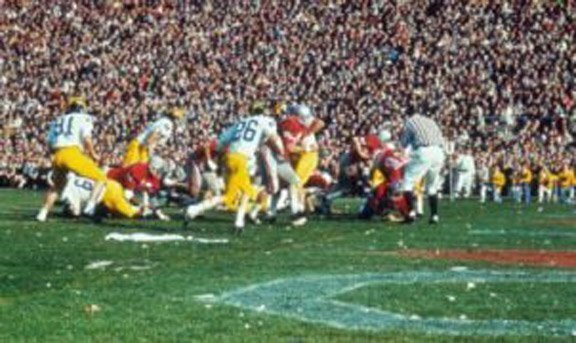 Several halves pop from the archives; the Buckeyes finished that infamous 1968 Michigan game on a 36-0 run (it would have been 38-0 had Woody's 2-pointer succeeded, damn it). The winner of that game got the Rose Bowl trip, and those Wolverines were ranked #4 in the country. In '68 the road to Pasadena was paved over Michigan. Michigan's season high for points allowed in an entire game had been 22 and it barreled into Columbus averaging 32 ppg on an eight-game winning streak. Ohio State won 50-14. It's now remembered more as a legendary game than just for its crushing second half. It was the game that forced Bump Elliot into a desk job, cleared the way for Bo Schembechler and created Ohio State's timeless Because I Couldn't Go for Three bumper sticker. A fun Woody-era stat: The Buckeyes finished that game with fewer passing yards (46) than points. SPOILER ALERT: Devin Smith doesn't even need two catches to beat that by himself. There are also other candidates for the Best Half Ever™. In 1995 Ohio State blazed out to a 56-0 lead against a ranked Iowa team before backups allowed 35 straight to end the game. The 2001 Buckeyes went into halftime leading Michigan 23-0 in Ann Arbor - where they hadn't won in 14 years - and hung on to win 26-20. Both were memorable halves against worthy opponents that lost some shine in how the leads were managed. That 2001 edition of The Game was the Tresseliest of all time. There are more - we see you, first half of the 2011 Sugar Bowl - but if you take into account the scores, statistics, circumstances and stakes there's one half of extraordinary football that stands out above the rest - and it just took place in December. What Ohio State did to Wisconsin in the 1st half of the 2014 Big Ten Championship is without peer. There have been 1,120 halves of Ohio State football since the second half of that 1968 rout of Michigan, and you will fail to find one comprehensively better than the first half of the 2014 Big Ten Championship game. Unlike those 1995 and 2001 games against Iowa and Michigan, nothing was squandered after halftime. 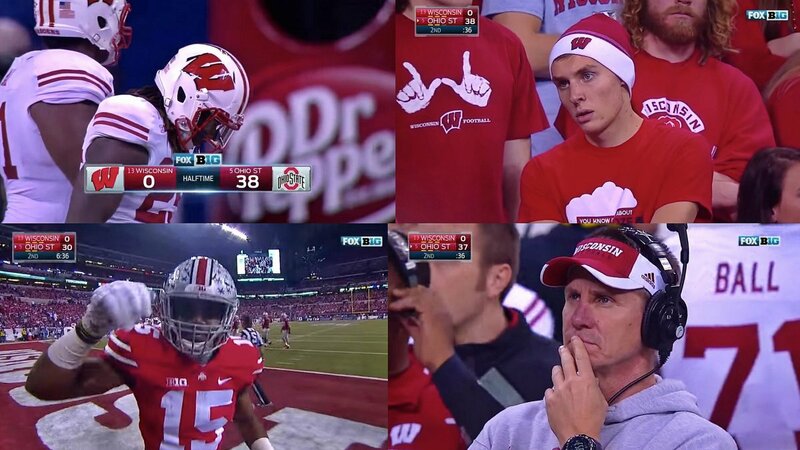 What Ohio State did to Wisconsin in the first half of the 2014 Big Ten Championship is without peer. It's almost hard to believe it was overshadowed by the Buckeyes' two other postseason games. The novelty of the first-ever College Football Playoff and the continuation of their improbable run are both to blame. We did not get to fully appreciate that first half in part because not even 12 hours after the game ended - while we were still trying to believe it was real - the College Football Playoff teams were announced. We never had the chance to marinate in the win. Career statistics that came with a mop. The shine of the Big Ten title immediately gave way to Alabama and championship tension, which gripped us until the Buckeyes had finished beating down the Ducks 37 days later. By that time there was almost too much to celebrate. Now that it's all over and the tension is gone we can look back in awe at the finest 30 minutes of football any Ohio State team has played in over 46 years. It just happened. It's still on your DVR. Forty-six years. Urban Meyer was four years old. This is pre-moon landing stuff. This is history. Consider the circumstances. The Buckeyes were down eight players in the two deep from fall camp and had attended a teammate's funeral that week. Positive energy should not only have escaped them; it should have been repelled by them. Notice how we haven't mentioned the QB situation yet. The Badgers entered with significant statistical advantages in most categories: 2nd-ranked defense nationally; 4th in points allowed and a Heisman candidate whose games were televised before two-thirds of the country went to bed, unlike the Oregon signal-caller the Buckeyes weren't even thinking about at the time. Heisman voters are watching! shouted Gus Johnson atop the broadcast, in reference to Wisconsin RB Melvin Gordon, the most prolific back in history not named Barry Sanders. The Badgers - as mediocre a tyrant as the Big Ten has ever seen - were nonetheless attempting to win the conference crown for the fourth time in five years. Cardale Jones had thrown 17 passes all year, fewer than J.T. Barrett threw in each of the previous 11 games. Ohio State would start Cardale Jones at quarterback for the first time ever. He had thrown 17 passes all year, fewer than J.T. Barrett threw in each of the previous 11 games. There was understandable anxiety about what the plan would be with a player whose entire reputation was based on one bad tweet entering the game. Curtis Samuel returned the opening kickoff to 23. Jones confidently flipped an 8-yard dart to Michael Thomas on the first play of scrimmage and everyone exhaled. He completed a pass. Okay, phew. That one even looked accurate. Ezekiel Elliott worked the inside and outside for 21 yards over the next three plays, loosening up the Badgers enough for Jones to complete another pass to Corey Smith for nine yards. It was another dart, and he released it without hesitation. The sixth and final play of the drive was a 39-yard touchdown bomb to Devin Smith. Jones' jubilant reaction to the score was as good as the play itself. You could say it was when he finally exhaled. He had gone 3/3 for 56 yards to three different receivers. How about this!? Johnson asked the viewing audience as Jones cackled his way up the sideline. Wisconsin went 3-and-out on its first possession, which included the first of many fumbles. Ohio State's next drive failed to produce, but Cam Johnston launched a 73-yard punt and completely flipped the field. The Badgers gave the ball to Gordon five times on the next drive but came up empty, pinning the Buckeyes on their own 7-yard line after a worthy punt of their own. "Just be who you are, Cardale Jones," Fox Sports analyst Charles Davis said, "you have plenty of support around you." The 1st quarter of the B1G Title Game was the best of the season...until the 2nd quarter happened. Two plays and 93 yards later Elliott was in the end zone celebrating. Ohio State was now up 14-0 and the best running back in the country had yet to make a dent. Lucky was the feeling as the two scores had come on big, surprising plays. Once Wisconsin settled down and began feeding Gordon it was certain to tighten up. Hopefully this 14-point head start will be enough. After all, Indiana's Tevin Coleman, Minnesota's David Cobb and Sparty's Jeremy Langford had combined for 570 yards and 9 TDs against this defense in November. Hell, Michigan's Plan C, Drake Johnson, got 74 and 2 TDs in only three quarters the previous Saturday. Gordon was a superior back on a much better team. And he showed it on the following drive, rushing for 27 yards on three consecutive carries before Vonn Bell snatched Joel Stave's pass on a play-action play that was predicated on the Buckeyes focusing too much on Gordon. Two Jones ropes later - including one to his fourth different receiver, Jalin Marshall - and the quarter ended with a 1st and goal from the Wisconsin 8. The Buckeyes were up two scores, were inside the nation's 2nd-best defense's 10-yard line, had 231 yards of offense and allowed the Badgers to cross midfield for one play, an interception. It was the best quarter of the season. And somehow, this turned out to be the weaker quarter of the first two in Indianapolis. Jones opened the 2nd quarter with his first incompletion of the game, missing a wide-open Elliott on what would have been a walk-in touchdown. His only other miss would be to Evan Spencer a couple of drives later. It would have been another score; still not bad for a first-time starter making all the correct reads. Sean Nuernberger's field goal preceded the Badgers going 3-and-out again, as the Buckeyes stonewalled Gordon. Ohio State got the ball once again on its own 37 with Jones one passing yard short of tying his season total two minutes into the 2nd quarter. That ensuing drive ended after three brilliant plays: A 10-yard laser to Thomas on an out route preceded a correct read on an option to Elliott for nine more yards. On 2nd and 1 with the Badgers blitzing, Jones calmly hoisted a majestic arc right into Devin Smith's arms in the end zone. Scroll up to the top of this page. That's the only way a deep ball reaches a covered receiver. It's perfect. This was noT a fluke. This was an ambush. The crowd roared again. Ohhhh my goodness! Devin Smith again! 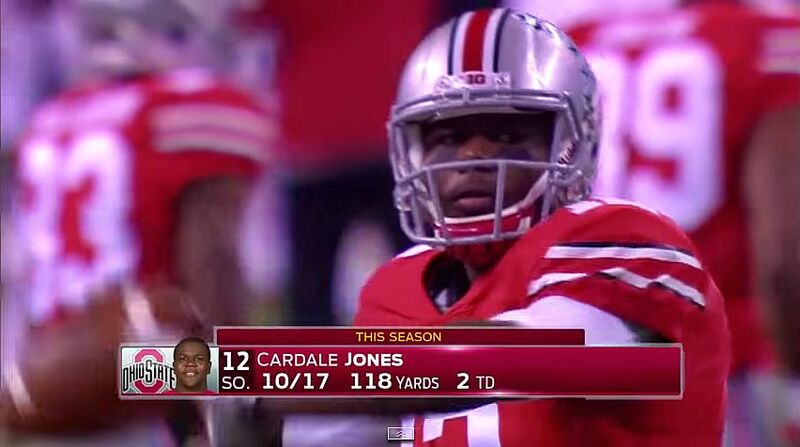 Cardale Jones, baby! screamed Johnson. The PAT made it 24-0. Ohio State had four scoring drives barely into the 2nd quarter, with the longest one lasting 2:41. Ohio State's defense was matching the offense in dominance; Wisconsin's ensuing 3-and-out gave the Buckeyes the ball again at their own 32, and the coaches had no intention of letting up. Jones had a green light to go, and he found Evan Spencer and both Smiths on three consecutive plays for 13, 21 and 12 yards. No one was open on the fourth play so he ran to the Wisconsin 14-yard line. When Elliott finished the drive on the following play (31-0, 6:36 remaining in the half), the crowd noise noticeably changed from exuberance to bewilderment. This is really happening. Ohio State entered the title game still serving what felt like a life sentence for losing to Virginia Tech at home 13 Saturdays earlier. With every passing week, as the Hokies continued to reveal their mediocrity, the Buckeyes were barely rewarded for winning. By the time the B1G title game arrived the Buckeyes still had not fought their way into the playoff. They were outside of the top four, and they weren't getting any help sneaking into it by way of attrition. Something extraordinary was going to have to take place in order for them to qualify. This was that something: Ohio State's electrifying playoff campaign was being simulcast live in parallel to its destruction of Wisconsin, who was a 3-point favorite and playing not only for its own postseason destination but also running a campaign of its own on behalf of the Heisman Trust. A 31-point lead felt comfortable, but that contentment was temporarily splintered when Corey Smith was ejected from the game, thanks to yet another dubious interpretation of the targeting rule. It should be noted that he laid his shoulder into LB Joe Schobert's chest in an identical block to one he legally laid on Michigan's Jarrod Wilson a week earlier. The penalty and subsequent lengthy review were the only things capable of siphoning the energy created by the Buckeyes' performance, but that brownout barely lasted a minute. Johnston's punt pinned the Badgers inside their own 5-yard line; four plays later Michael Bennett punched the ball out of Gordon's arms, resulting in Joey Bosa scoring the second TD of his career. Bosa punctuated Ohio State's finest half of football with his signature celebratory shrug in the end zone. 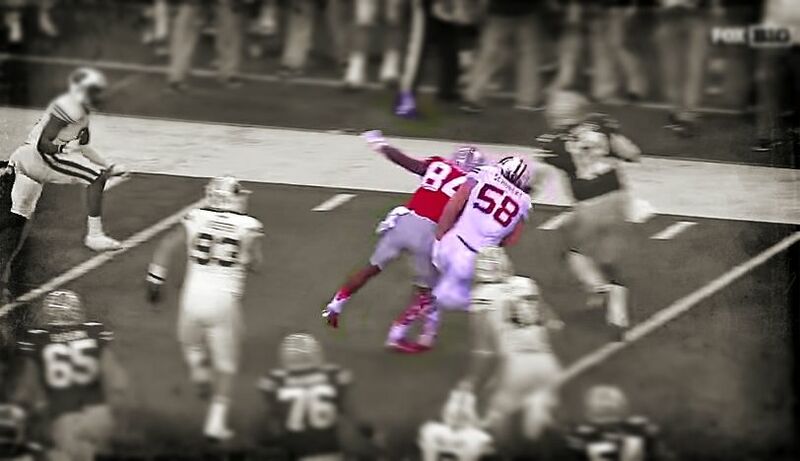 As emblematic of Ohio State's Next Man Up mantra as Jones' performance had been to that point, this defensive sequence was just as illustrative: The play prior to Bennett's strip and Bosa's score was a Stave sack by Rashad Frazier, a fill-in for Noah Spence - the team's top returning rush end entering the season - with apologies to Bosa. In 1968, Woody went for two because he couldn't go for three. These Buckeyes would make him envious. The play after Bosa's touchdown - following the PAT and kickoff - was a sack by Steve Miller, another fill-in for Spence. All three plays featured either near-fumbles or real fumbles. As Johnson shouted while Bosa's teammates mobbed him in the end zone: Blood! Thirsty! The broadcast cut to commercial break with the score 38-0 with cameras cued on DC Luke Fickell spontaneously celebrating on the sideline. The half ended with Miller destroying Stave again on a desperation throw that would have been picked off by either Curtis Grant or Armani Reeves had they not collided. "This is a thorough of a dismantling of a quality football team as we've seen this year," said Charles Davis prior to the second half, "and I don't think it's hyperbole to say that either." The over/under for the game was set at 56 points; the Buckeyes would eclipse that on their own. When the final whistle blew, Ohio State had clinched a spot in the playoff, which the formal announcement would confirm the following morning. This performance was undeniable proof of something TCU, Baylor or any other team could not claim: An historic, resounding and comprehensively dominant performance with everything on the line in a championship game. In 1968, Woody went for two because he couldn't go for three. These Buckeyes would make him envious: Three title games, three Heisman finalists, three memorable victories. They went for three and they got it. The 2014 title run removed the sour taste still lingering in fans' mouths from 2006, when the Buckeyes were ranked #1 every week of the season except the final one. These Buckeyes accomplished the opposite: They didn't reach #1 until the last possible game. From that awful loss to Florida through the championship win over Oregon, the Buckeyes accumulated 88 wins, thousands of points, a national championship - and played one nearly-flawless half of football when it was the only possible way to save their season. What's the most dominant half of football Ohio State has ever played? You just saw it. The best chance of ever seeing anything like it again is probably still on your DVR.